I was trying to learn my Meowster Manners - yep uh huh. Didja ever hear somebody scream"do the dishes?" Always, yep uh huh, always you wanna give up your space for your house guest. don't want to see spots or dots on your glasses. cat chatting with dat friend. It's meowvalous to purrractice being EGGstatic over simple stuff. Well that's all my smitten kitten Minding My Meowsters Manners tips I learned. Now YOU know I wish YOU the mostest nonCATastrophic week - uh huh I do! Just one day a year we can all purrrtend weeza Irish and everybody believes it. Yep uh huh it's for sure. You gonna be seeing a sea of green everywhere and on your munching luncheon plate too! Pssst my organicatnip is as green as can be & no plate required. 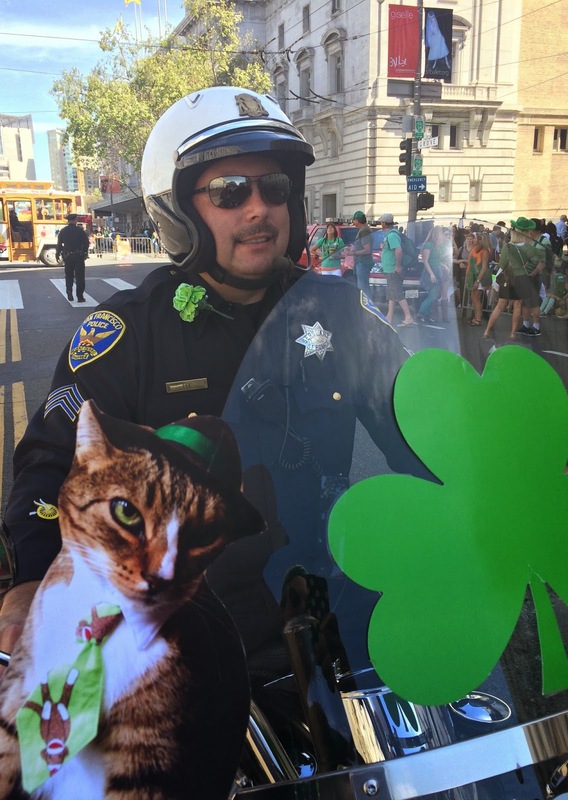 San Franfuncisco's finest SFPD wearing the green on the machine. with this inky dinky lil leprechaun sized jug. Catzowey! Lil sisfur Grappa kissed the birdie blarney stone today!